Hyderabad, Metro Rail News: The Governor of Telangana & Andhra Pradesh Shri. E.S.L. 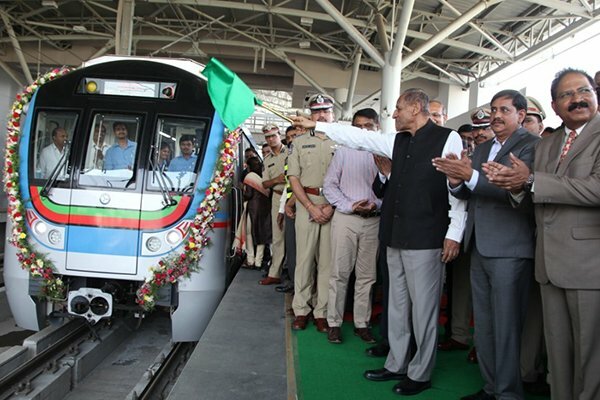 Narasimhan flags off the much-awaited metro rail services of Hyderabad Metro from Ameerpet to Hitech city metro, the IT hub of Hyderabad on March 20, 2019. The 10-km long section (Ameerpet to Hi-Tec City) of Hyderabad Metro Rail Corridor-III was launched by the Governor at Ameerpet metro station. This section have nine stations, including Ameerpet, would establish the crucial Metro Rail connectivity to the highly congested IT/ITES service areas of Hi-Tec City, Madhapur, Gachibowli, Jubilee Hills, Hyderabad Metro Rail Limited (HMRL) officials said. In November 2017, PM Narendra Modi had inaugurated the 30km stretch (between Miyapur and Nagole) out of the 72km long elevated Hyderabad Metro Rail project. The 16-km stretch between Ameerpet and LB Nagar was launched in September last year. Regular operations will start from 4pm on March 20, 2019,. Among the nine stations (Ameerpet-Hi-Tec City stretch), Taruni-Madhura Nagar station is being developed as a women managed station and in due course would have shops mostly catering to their needs and that of children. “The Jubilee Hills check post station was a single level one unlike other stations which are mainly on two levels.” Said NVS Reddy, MD, HMRL. The concourse level was avoided to reduce the already high level of the station due to gradient related problems, he said. HMRL officials said trains would initially run on a five km stretch between Jubilee Hills Check Post and Hi-Tec City station following a traditional railway practice of ‘twin single line method’. In this method the two tracks are treated as two separate single lines and trains are operated in both ‘up and down’ direction on each line separately, till the ‘reversal’ beyond Hi-Tec City station is completed. the frequency of trains between Ameerpet-Hi-Tec City will be nine to 12 minutes as against six minutes in other parts of the operational Metro corridors. Efforts are being made to add additional trains in the stretch to improve frequency and to cater to the huge rush that is expected, they said. The concessionaire L&T Metro Rail (Hyderabad) Limited is building the Hyderabad Metro Rail project across three corridors. The Governor of Telangana & AP Shri. E.S.L. Narasimhan, Dr. S.K. Joshi Chief Secretary, Telangana, HMRL MD Shri. N.V.S. Reddy & other officials Takes Metro Ride after inauguration.